Opening in summer 2020, the hotel will be filled with the art of Marvel Super Heroes including Iron Man, The Avengers, and Spider-Man, all living alongside the Big Apple atmosphere. 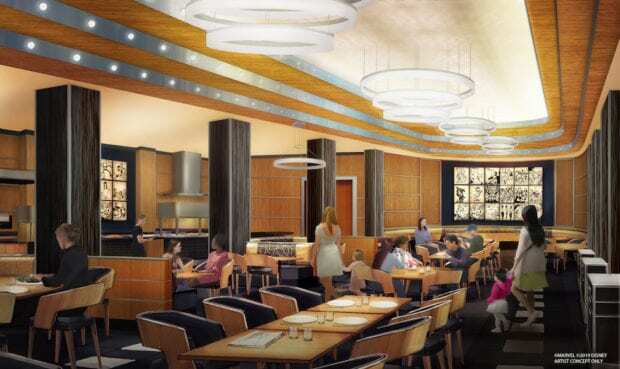 An artist’s rendering of the hotel’s rethemed lobby. Since 1992, the Hotel New York has welcomed millions of guests and immersed them in New York culture, the architectural design of Michael Graves, and the atmosphere of the Big Apple. As the hotel prepares for its big renovation, Disneyland Paris celebrated the cast members and history of the resort by sharing new details on the upcoming retheme. The hotel’s new look will evoke a luxury and contemporary Manhattan establishment, with sleek interior design in the style of Tony Stark and the Avengers Headquarters. Limited edition art pieces will adorn the walls of rooms and suites in the hotel, and pieces on display in public areas will showcase the diversity of art from the Marvel universe, including comic art, film, design, sculpture, and costumes – all on display in the style of a modern New York art gallery. Art pieces will include comic book covers, posters, concept art from the films, storyboards, production design, props, original sketches, media, and more. An artist’s rendering of the hotel’s rethemed rooms. The hotel will feature 476 standard rooms, 65 executive rooms, and eight standard suites. The rooms’ interiors will reflect the urban sophistication of Tony Stark’s tastes, with a color palette that calls back to his Iron Man suit. 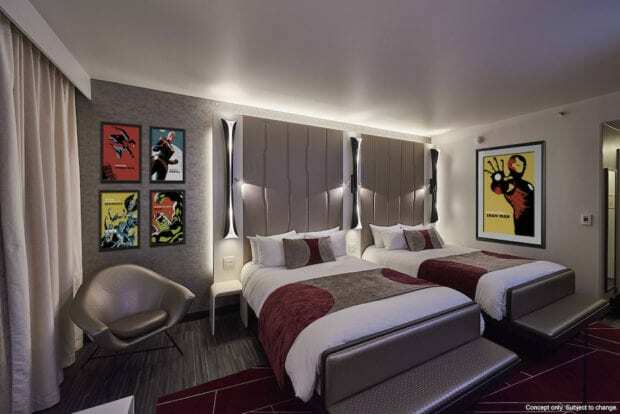 The hotel’s one-of-a-kind suites will be themed around Marvel Super Heroes and New York City. For these suites, a Marvel artist will be commissioned to create pieces for the rooms featuring the heroes. 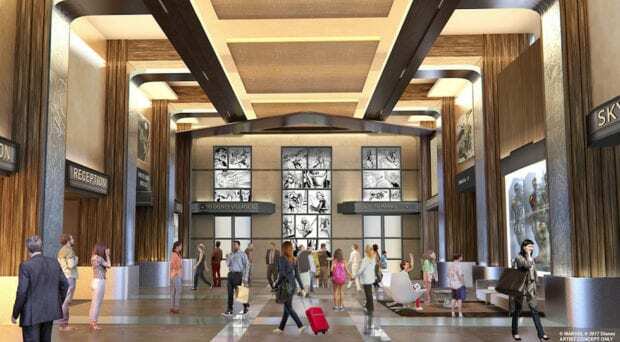 Disney’s Hotel New York – The Art of Marvel is expected to open its doors to guests in summer 2020. 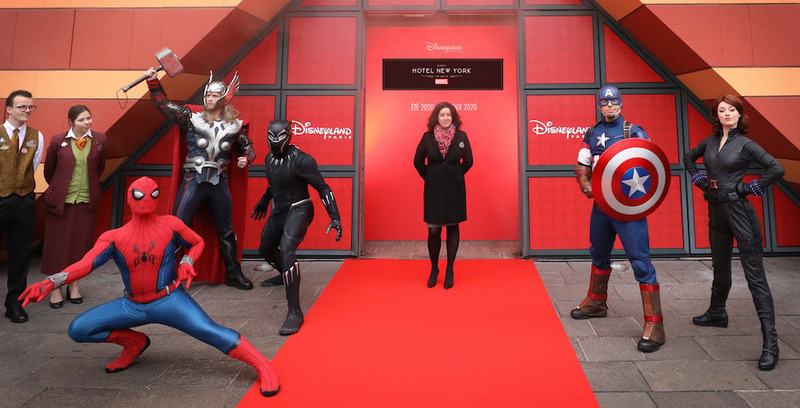 To learn more about Marvel’s presence at Disneyland Paris, head to DisneylandParis.com/en-us.